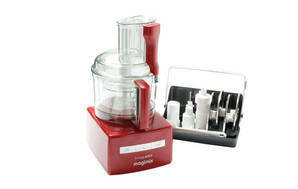 Snapshot: The Magimix 4200XL food processor has 1 speed and has storage for attachments. How does it rate? Excellent in our cheese-grating test. Very good results in our mayonnaise-making test. Comes with a “blender mix” attachment that fits into the processing bowl for blending tasks. Comes with large, medium and small processing bowls. Only dishwasher safe at minimum temperature and without drying cycle. Processor blade performs better than dough blade for kneading pastry. Also available in white. "Magimix 4200 XL - Outstanding." 24 May 2015, Timothy M.
It's weight - take take heavy loads, 3 different bows for different sizes. Can replace so many other machines in the kitchen. Whilst the bowls are dishwasher safe - it's better to hand wash them otherwise they get cloudy over time, that's all. 08 Oct 2014, Karen H.
It has 3 different size bowls, and you can have other accessory's that you can add to saves having other machines. It has been built well and seems to do everything I have put in well. Easy to clean I do not put it in the dishwasher to clean. hot soapy water does the trick . Love how the chute is bigger so you are able to get larger items down it easier. "Very happy with Magimix 4200 xl"
04 Oct 2014, David & Joanne F.